It is one of the most talked about goals of our time – the infamous work life balance. It is constantly strived for yet no-one really feels like they have managed to achieve it. Your balance will vary throughout your working life as things take different priorities in your life but you need to try and find one that is right for you. There is more to life than work and by not allowing your job to take away your social life you should be able to be a happier and productive employee. If you are young and keen to work your way up the career ladder then you will probably be more willing to put in long hours at work. If you have a partner or eventually a family, then your home life is likely to become your priority. Knowing what it is that you want to focus on the first step to being able to achieve it. Prioritise the important things in your life and try to adapt your work to suit you. Many employers these days offer flexible working hours. This may mean that you can start or finish work later, work from home or make your own combination. This can help you find a work life balance that is right for you. Talk to your employer about the options and be ready to explain why it will make you more productive and useful to the company. You may be surprised how open they are to the idea. It is easy to say that you will leave work on time or make sure you have a night out to socialise but then not actually do it. By booking dinner with friends, joining an evening class or making a hair appointment you will make yourself leave the office. Try and find at least one weekday night a week that you can fill with something fun or socialise with friends. When you are trying to impress your boss at work you may be tempted to slip back into old habits. However, by looking at the way you work and working smarter, not harder, you should be able to get the same amount done but in a more efficient way. Make a commitment to yourself to concentrate on your work life balance and change your working patterns to do it. 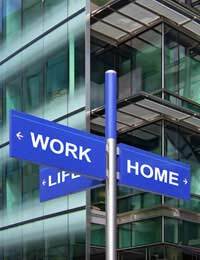 It is important for your stress levels and home life that you try to find a work life balance that suits you. Work out what your priorities are at this point in your life and then talk to your employer about the possibility of flexible working. Make a commitment to leave on time at least once a week and make arrangements in the evening so that you are forced to keep your promise to yourself. If you let your work consume you then you will ultimately become less productive and not such an asset to your company. Stay happy, focus on your work life balance and be good at your job and to yourself.